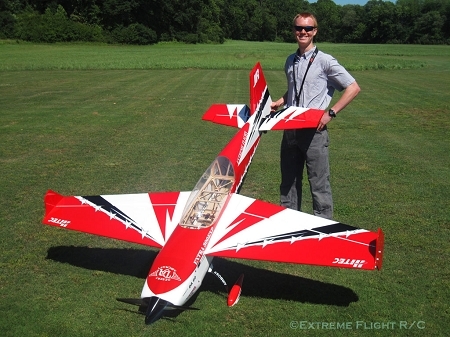 When Extreme Flight released our first EXP series aircraft in 2009, the 48 inch Extra 300EXP, it was met with great enthusiasm from the RC community at large and has become one of our best sellers to date. 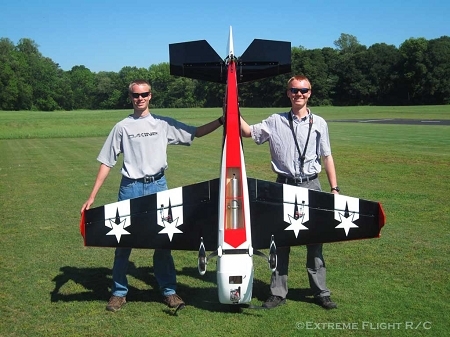 Since then the EXP line-up has grown considerably and this designation has become recognized worldwide as the gold standard in high performance 3D and precision aerobatic aircraft. The 91" EXTRA 300EXP builds upon this legacy. Taking cues from the multiple EXP models that preceded its release, the 91" Extra 300EXP incorporates all of the unique features that make the EXP line-up so successful. The first thing you'll notice is the EXP size control surfaces, which on an aircraft this size are simply gargantuan! Extreme pitch, yaw and roll authority are the backbone of aggressive 3D flying and the 91" Extra delivers like no other. Of course for the aircraft to survive the aggressive maneuvers that these huge surfaces allow, extra special attention must be given to the design of the aircraft. The 91" Extra's wing uses a carbon fiber wing tube joiner, square carbon fiber tube main spars, a secondary hardwood spar in the D tube forward section of the wing and extensive use of shear webbing to provide a rigid and structurally sound wing capable of handling the most aggressive maneuvers. Just like its smaller EXP siblings, the 91" Extra features carbon fiber longerons, which add an enormous amount of strength and rigidity to the fuselage and make it much easier to handle during transport. 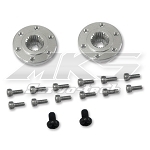 A full length tuned pipe tunnel is also built into the fuselage structure, and a cover is included which allows easy access for mounting the pipe or canister muffler. 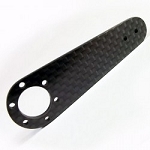 The 91" Extra features a one piece fiberglass cowl which mounts easily using a pre-installed cowl ring and 2 bolts for attaching to the fuselage. A beautiful set of airfoiled carbon fiber main gear are included as well as a complete hardware package which consists of a carbon wing and stab tube, carbon fiber tailwheel assembly, Dubro ball links, titanium turnbuckle pushrods, dual truss G10 composite control horns, wheels, axles, a Pilot X helmet head figure, detailed instrument panel, wing and stab bags and a canopy cover. Also included are a set of removeable Side Force Generators(SFG's) to expand the flight envelope of the Extra. The Extra is available in 2 gorgeous highly visible Ultracote color schemes. 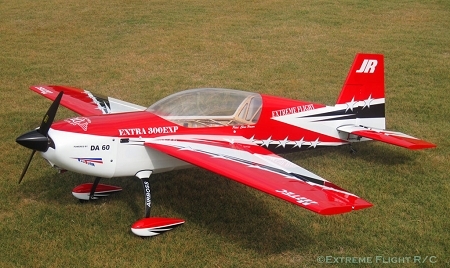 If you are truly serious about your hobby and demand the best in quality, performance, value and support, the new Extreme Flight 91" Extra 300EXP delivers the goods!